For the last couple of days, I have been trying to connect my Bind9 server to my AD's DNS as a secondary zone, to no avail. The problem seems to be that when trying to get a zone transferred from the master, the packets will be dropped, though there are no firewalls that should be rejecting them. 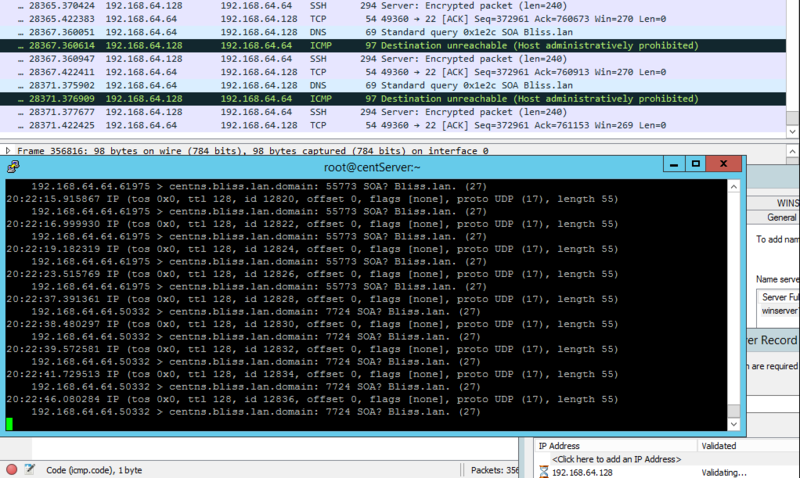 I can ping all of them with no problem, and I can also transfer the zone via nslookup from a normal windows client. It says something about keys, which I am assuming has something to do with DNSSEC, even though I have no configured DNSSEC on any of the machines yet. I am still sort of new to Linux, especially when it comes to administration of servers. 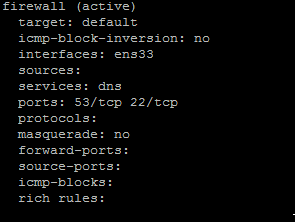 Here is my named.conf for the secondary and reverse zone on my CentOS server. Sorry if I am lacking information, just tell me and I'll provide some. Your wireshark clearly shows 192.168.64.64 sending a packet to 192.168.64.128 on port 53 and getting an icmp "Host Administratively Prohibited" back. That's a firewall rejecting the packet. What is the output from the iptables-save command when run as root on 192.168.64.128? This is the output from iptables-save. I am using firewalld, where I added port 53 and 22 to get accepted. That may be just for an inbound connection though.. I have tried with firewalld stopped and also with Windows firewall stopped. Though since I know that firewalld is built upon iptables, it might be the problem? I did not do --add-service=dns, no. I tried running it, but it still gets blocked.